Germanium may not be a household name like silicon, but it has great potential for use in next-generation electronics and energy technology. Of particular interest are forms of germanium that can be synthesized in the lab under high pressure conditions. One of the most promising forms of germanium for practical applications, called ST12-Ge, has only been created in tiny sample sizes — too small to definitively confirm its properties. Attempts to experimentally or theoretically pin down the characteristics of ST12-Ge have produced widely varying results, in particular the electrical conductivity, a situation that points to the critical need to synthesize the material in larger quantities. Recent experimental efforts led by Timothy Strobel have now resulted in the ability to create ST12-Ge in a large enough sample size to confirm its characteristics and useful properties. Using the multi-anvil press at the Geophysical Laboratory, elemental Ge was compressed to 14 GPa at room temperature and slowly decompressed to ambient pressure. The decompressed sample consists of ingots approximately 15 mg in mass and 2 mm in diameter and length. ST12-Ge has a tetragonal structure, as illustrated in Fig. 1 (the structural code ST12 refers to a primitive, or simple tetragonal structure with 12 atoms in the unit cell). When polished into small bars, the ST12-Ge samples may be studied using a variety of spectroscopic techniques. 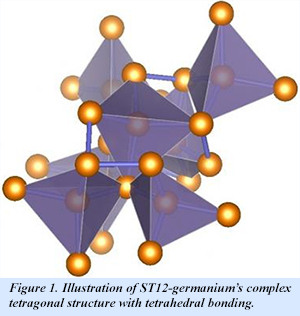 Like the most common, cubic diamond form of germanium, ST12 is a semiconductor with an indirect band gap and consequently a less than optimal efficiency in the absorption of visible light. However, due to the size of its indirect band gap (0.59 eV), ST12-Ge may be a better material for infrared detection and imaging technology than the cubic diamond form of the element currently used for these purposes. Measurements of electrical and thermal properties of ST12-Ge, now enabled by the synthesis of large, high quality samples, will further define its potential for practical applications [Z. Zhao et al., Nature Comm. 8, 13909 (2017)].